Asha 501 is the latest offering from Nokia for the budget level buyers with a price tag of Rs.4899.00. The Asha 501 is based on Symbian OS and looks nearly like a Nokia Lumia smart phone on the outside. This is a excellent smart phone for those who want a touch phone with all the capabilities and yet are short on budget. In this article we will look at Nokia Asha 501 from all angles and help you make a wise choice as to whether you will buy it or not. As I have already said above, the Asha 501 looks surprisingly similar to the Nokia's Lumia series smart phones and at first glance even you may think so. Asha 501 comes with the custom rugged body and firm chassis which is a Nokia signature. The front portion has been made very appealing by the Nokia engineers with all black front panel. The rear panel is bright can be fitted with custom colourful exchangeable rear panel. 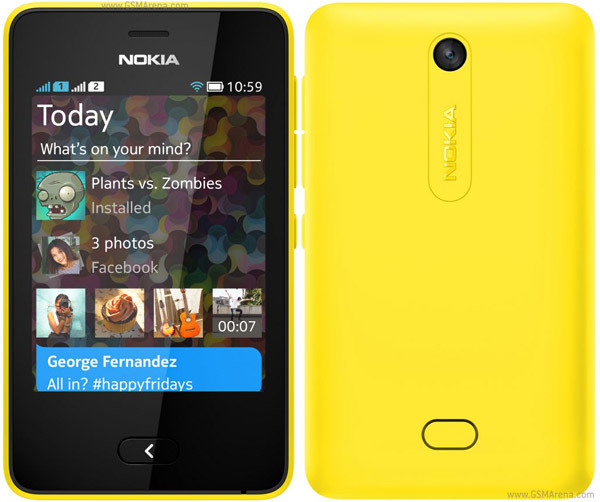 Right now Nokia Asha 501 is available in six colors viz black, white, red, green, blue and yellow. The front panel is a capacitive touch panel with a scratch resistant coating. The front side sports only a earpiece (phone microphone) at the top and a protruding back button at the bottom. Nokia engineers have adjusted rest of the controls within the Symbian interface itself and are swipe based. On the right exterior there is power/standby button and the volume control button. The volume control button is pretty big and has a responsive feel to it. On the top there is a micro USB PC interface, a headphone jack and a fine pin charger port(old Nokia style). Another advantage with Asha 501 is that you can use the micro USB port for charging in case you are travelling. The back panel hold the main camera which is 3.15MP affair giving you a resolution of 2048 x 1536 pixels. This camera can give you a QVGA output@15fps. There is no flash to the camera for taking images in dark spots. The speakers are situated at the bottom of the rear panel. There is a small nub below it which when pushed downward releases the rear panel to give you access to the battery which is of 1200 mAh capacity which gives you a talk time of almost 17 hours and a whopping standby time of 624 hours which is almost a month (26 days). The rear compartment also has space for 2 micro SIM slots (Yes Asha 501 is dual-SIM (microSIM + microSIM) smart phone) and a microSD memory Slot which supports upto 32GB memory. However Nokia 501 ships with 4GB memory bundled in at the time of purchase alongwith a travel charger and a headphones. Size wise Nokia Asha 501 is 99.2 mm tall, 58 mm wide, 12.1mm thick and just 91 grams. Nokia Asha 501 supports dual-SIM GSM + GSM in a hot swappable mode which means you can keep the phone operational while replacing the respective cards. It has GPRS and EDGE support for mobile Internet but sadly no 3G support which is missed sorely on this beautiful phone. 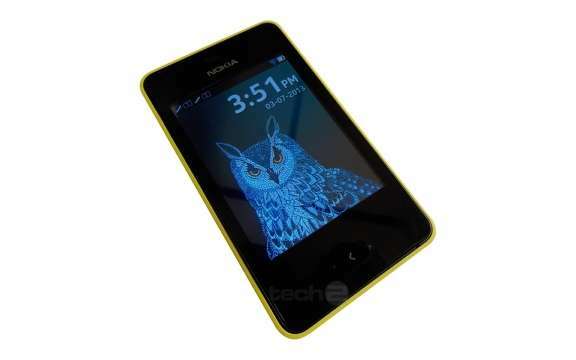 The phone runs on the Nokia Asha software platform v1.0 with most features similar to the smartphone category. It sports a 3-inch capacitive TFT display with a resolution of 240 x 320 pixels and two-fingered multi-touch capability. The internal hardware comprises of a 1 GHz processor, 128 MB of storage and 64 MB of RAM. The 128 MB storage is basically for installing apps and user data needs to be stored on the SD card. 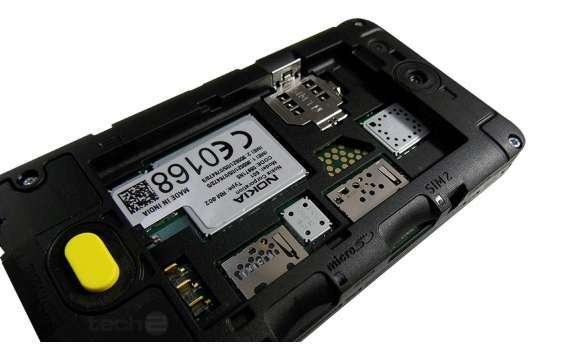 Other then GPRS and EDGE the Asha 501 has Wi-Fi b/g(no n), Bluetooth v3.0 with EDR and a micro USB 2.0 PC interface. So a good smart phone available for a decent price of Rs.4899.00. The Asha 501 is a good phone if you don't indulge in too much internet (fast net) and are happy with having a Nokia rugged phone. The choice is yours, if you like the phone you can buy it from here for a White one for Rs.4898.00 and here for a Black one.